Colts.com writer Kevin Bowen stated that Indianapolis Colts undrafted free agent TE Darrell Daniels is a strong candidate to make the colts 53-man roster. The Colts have kept at least one UDFA on the final roster for 18 consecutive seasons. The Colts currently feature a very inexperienced tight end group. 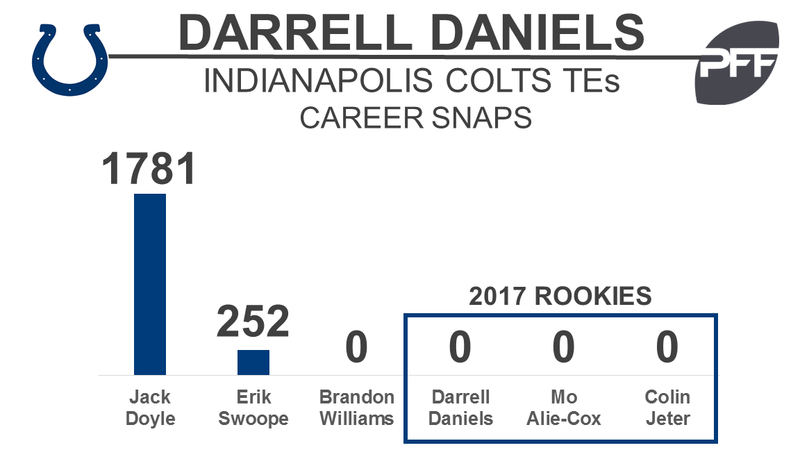 After starter Jack Doyle, Erik Swope is the only other tight end to have played in an NFL game and has logged just 252 total snaps. Hailing from Washington, Daniels was PFFs 13th ranked tight end of the 2017 draft class. Over his college career, he averaged 364.3 snaps a season, a 73.2 receiving grade, 70.7 run blocking grade and a 72.0 overall grade.